I have found your site extremely helpful so firstly thank you for all the information. I have been with my girlfriend for some time now and so I started researching diamonds fairly religiously. She told me that she didn't want a round brilliant cut and she wanted a rose gold band…the rest was up to me! She also mentioned that she liked the idea of a cushion cut. I also decided that I wanted the diamond to be GIA certified and my budget was approximately 6000GBP total I searched multiple stores but most of them didn't have anything within budget or didn't meet the criteria I had defined. I then found a stone on blue nile last week while searching and it fit absolutely everything! so I took a leap of faith and bought it in a setting that I really liked! I then however, couldn't help myself and took the certificate to the store I trusted the most when I had been doing my research to see if there was anything I had missed. They pointed out to me that the inclusions on my stone were going through the girdle and so this posed a risk to cleavage. I read your article on feather inclusions in VS2 stones however and it doesn't seem like my inclusions go from top to bottom, despite being near the girdle, as the store had said. Am I right in saying the image on the GIA certificate flips on an x axis not a y axis as you have shown on your site? And since this is a VS1 stone, these inclusions really shouldn't be an issue? They also pointed out that my L/W ratio was 1.1 making my stone quite rectangular. This hadn't been something I had looked into and originally would have preferred a squarer stone but they also mentioned squarer cushions shine more brightly. Is this true? The idea of a rectangle cushion has grown on me a lot since they mentioned it and I think I would now prefer it as long as it doesn't affect the shine very much! Do you think a 1.1 L/W ratio will even produce a very rectangular stone? The other dimensions with regards to depth and table percentage (by chance) are rather ideal for my stone when I compare them to the dimensions you recommend on your site. Finally, my girlfriend loves rose gold and so I wanted to get her a rose gold band but leave the claws platinum so that the stone's shine is not affected. The jeweller I spoke to today said that platinum and rose gold was difficult to get right because of their different melting points and so online dealers were not to be trusted. I am sorry for the long email, I just really wanted to get an impartial opinion and ask if you felt that I have made a good purchase or whether you feel I should return the stone and aim for something else? 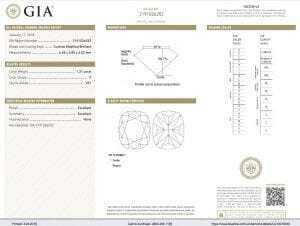 I have attached the GIA certificate of the stone I bought for you to look at and I would really appreciate your opinion. Thank you again in advance. Best Wishes! I am glad you checked in with me regarding this diamond. The sales people at the local jewelry store are misinformed. You have ABSOLUTELY nothing to worry about regarding the inclusions on the VS1 clarity grade. In addition, the ratio of a cushion cut is a matter of personal preference. And the L:W ratio does not have any relationship to the diamonds ability to sparkle/ reflect light. Furthermore, you can definitely have mixed metals on the ring. One for the prongs and one for the rest of the ring. Did Blue Nile confirm they can do that for you? I hope this helps! Thank you so much Sebastian! That’s really put me at ease. I was really happy to find this diamond so when they said that I was a bit disheartened. I’m sure they were just trying to make a sale. And yes, blue Nile have a selection of settings to choose from and I chose the rose gold band with shoulder set diamonds and platinum claws. It should arrive soon so I hope it will look nice! You are very welcome! And I am sure you will love the ring when you receive it. Congratulations!